The Riddling Skull And The Puzzle | Roblox Direct!! Theres this hat called the riddling skull. it was for alittle treasure hunt . people asked how to get it. well telamon was at a “meeting” or something… and players had to wait for the riddling treasure hunt place to be done. there was BETA testers. they got the hat before anyone. which made players mad. but today the ridling treasure hunt was going on at Yorick’s Resting Place. it was to find the skull and win the hat. it was easy as pie for some players. others are having a hard time. but it was fun! me and some friends went out to find the skull… toke us an hour to find it. but im not gonna tell you how to find it. your gonna have to find it out on your own. like the rest of us. nothing super cool about the skull hat but it looks great. but soon it will just become a plan old hat. to play the puzzle treasure hunt … go here! oh and Roblox Direct has OVER 40,000!!!!!! views! Yorick. Continue stepping the ice paths. Reach the mountain and climb it. Say fish on the Ice thing. Go through the green door.Follow the path. Continue till you see this white door. Say wind. Continue into the graveyard ( left of you ) Look for the top left grave ( from entrance is top left if you jump in then its last grave. Push it from that brick hanging on it. Fall into it. Thats all I can remember. Though here are two things you will have to do later on. Push the couch inside the mansion and fall in climb up the ladder look for a climbable ice thing and climb it. Follow the path and say darkness to open the door. Step on the thing with the skull. 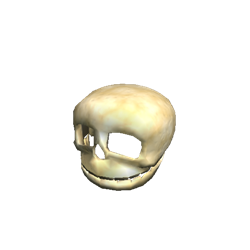 Wait till you die and there you are, skull unlocked. Look in hats to get it. I Got the skull very early. One way to get it was going to “godoflittlethings” place. all you had to do was hop the river an viola! I got seven of the riddling skulls.